Strawberry Chic: Happy Halloween . . .
From Princess Leia, R2D2, and the Giant Ewok. We had a church/family Halloween party on Saturday and it was tons of fun! I finished the R2D2 costume just in time (I mean literally...I finished it like 5 min. before we left...talk about procrastination!). The costume was made using a large piece of white fabric, felt (for the detail work), and old metal coat hangers which I cut, bent into a round shape, and then sewed them into the top and bottom of the costume. As for my husband and I, we headed to the thrift store just hours before the party and luckily we were able to scrounge together our Star Wars outfits. 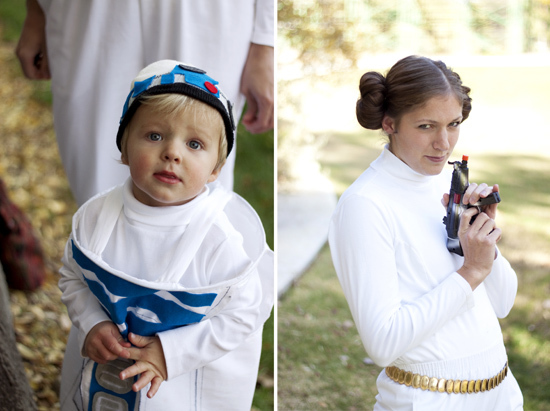 My Leia costume is just a white turtle neck, white pants, a shiny gold belt, and a fake gun from the dollar store. I also used THIS tutorial on YouTube to make my giant Leia buns. 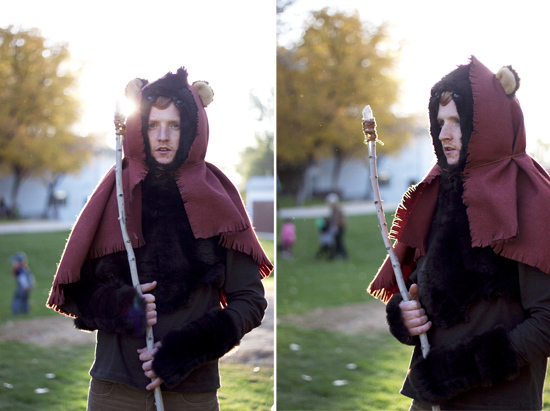 I will have to admit, my husband's Ewok costume was the most clever. He bought an old giant teddy bear at the the thrift store, took out the stuffing, cut off the face (a little morbid right?) and then added a rough piece of red fabric for the cape. He also fashioned his own spear out of a branch and stone from our yard! The best part about our costumes is that we put together all 3 for under $20! Tonight, we plan to stay home to pass out candy, finish our Harry Potter marathon, make homemade doughnuts, and take our little R2D2 around to trick-or-treat at a few of our neighbors houses! Andrea all three of your costumes look great! The detail work on R2D2 is awesome! And I have to say that cutting the teddy bear open was very clever! 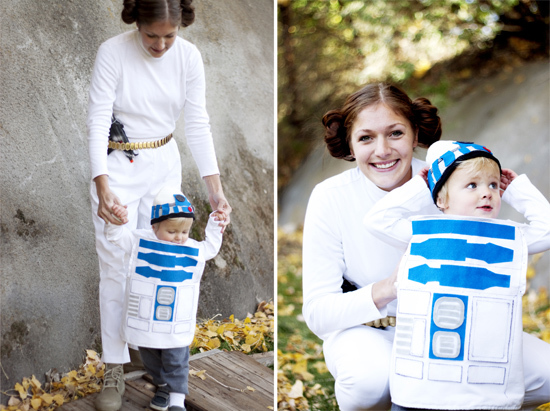 Such a cute family costume! You make a great Princess Leia! I wish we had a little guy to take trick or treating, so we are just staying in and watching Halloween movies. I like your homemade doughnut plan! Might have to consider that. I can't believe all this was done under $20 - ya'll are so creative! So stinking cute, I love them! Forgot to say how great your costumes were. Oh my gosh. So beyond awesome. We are such Star Wars fans so I love this!!! this is so cute I must die!!! !